Last night, Tom Brady and the New England Patriots beat Matt Ryan’s Atlanta Falcons in the first overtime Super Bowl game in history. 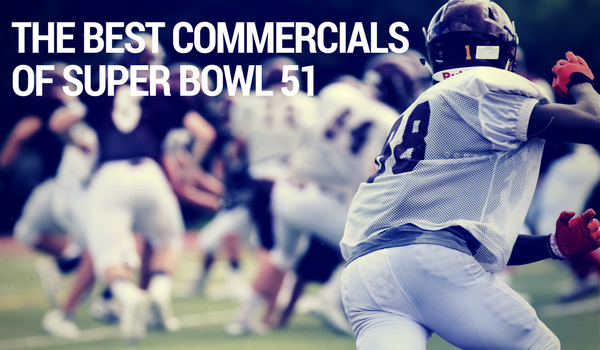 And if that wasn’t enough excitement for one night, marketers also had a field day watching the Super Bowl commercials. USA Today’s Ad Meter is the traditional determiner of Super Bowl commercial success—no surprise that Kia’s Hero’s Journey, Honda’s Yearbooks, and Budweiser’s Born the Hard Way were at the top of the list. Here are the ads we enjoyed last night. Babies are common commercial tropes: they’re cute, especially when they’re dressed up as adults. This ad from the NFL followed up last year’s Super Bowl Babies Choir and played right to the “Awww” factor and dressed up babies in iconic outfits from past Super Bowls. C’mon, whose heart didn’t melt at Baby Ditka? Who would have thought Mr. Clean would land a top spot in critic’s best ads lists? Forget the 50 Shades parody T-Mobile tried to pull off, Mr. Clean—and the cleaning husband—scored big on game night. While Snickers’ ad wasn’t the first live ad to air during the Super Bowl, it was the only one to air this year. And it played well into the Snickers’ brand of “You’re not you when you’re hungry.” The hype of Snickers pinning their hopes on Adam Driver for a live Super Bowl ad had been played up in the last week, so when Driver came out of the saloon seemingly unaware of what was happening, anyone’s first thought was disaster had struck. While the last shot of the ad should have let everyone know Snickers had executed the ad exactly the way they wanted, that didn’t stop them from continuing the joke, from this tweet to Driver’s apology video. A noticeable difference in this year’s ads was the inclusion of diverse casting, whether in direct comment to political happenings or not. Coke aired the It’s Beautiful spot, which had originally aired previously. The NFL created the Inside These Lines commercial, highlighting sportsmanship and unity despite superficial differences. But nothing could beat Airbnb’s We Accept ad. The closeness of the camera draws the audience in, seeing the differences and similarities in the facial features of the personas on screen. Normally we would expect a Snickers ad in this spot—the brand is known for their “You’re not you when you’re hungry” spots from the last few years that feature Betty White, Joe Pesci, and Danny Trejo. But this year Buick’s ad won us over, with a pee-wee quarterback transforming into Cam Newton. It’s not every Super Bowl that a delivers a quality Christmas Carol parody, but this year was an exception. Bud Light not only brought back a mascot from the 80s, but tried to create FOMO (fear of missing out) for the audience as Spuds tours around the main character to see on all that he missed out. Our only question was, if Spuds doesn’t have thumbs, how is he holding his beer? Throughout the night, we saw two Chicago-based accounts popping up in our Twitter feed: Second City and the RedEye. Both had fantastic observations on the game, the ads, and the political climate. Second City edged out RedEye by a hair . . . but based on this tweet, they probably don’t care. While ads like Sprint’s or T-Mobile’s clearly call out their competition (which might not be all that effective), some brands hit back at ads on social media throughout the game. Adweek’s self-deprecating tweet called out Bud Light and Snapchat. Verizon—who didn’t even have an ad during last night’s game—gave pitch perfect disses right back to Sprint and T-Mobile. Unfortunately no one will hear your safe word if you’re on @Tmobile. When you need the power to create stories, smiles, and super boldness, give us a call.